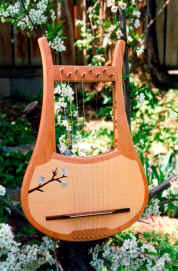 symmetrical lyre came to Egypt from Asia, with parallel arms, held upright. Asia and East Africa, in Ethiopia, the Upper Nile, and the Congo. So often seen in Renaissance paintings are depictions of angels with Lyres in the arms. is often thought of as having quadragular frame with string length being equal. tension and gauge, length is the main cause.